The funnest things I ever did when I was a kid was acting and fake fighting with my brother and our friends. And when I saw a James Dean documentary when I was twenty I knew I wanted to be an actor. 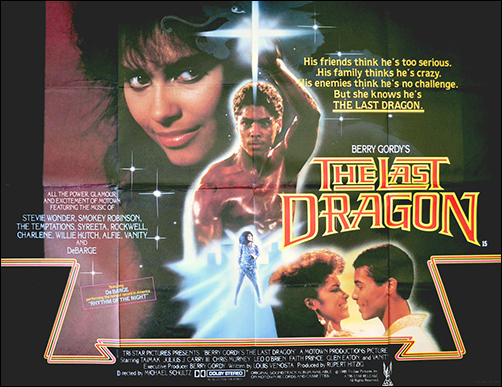 How did you get involved with the movie The Last Dragon? My sister was going out with Berry Gordy at the time and they gave me the opportunity to have dinner with them one night. Over dinner I told about the incidents I had when I was confronted with danger and how I would pretend that I knew Martial Arts . He really got a kick out of that so he basically put that character into the movie. I failed my first audition but got a second chance and that one seemed to work. I kept a lot to myself. I was more captivated with New York. It was like living in a movie. When I was on the set I was impressed by many things. How much dedication every body was putting into the movie. From the extras to the Stars to the Director and writer and Mr. Gordy. For a little while I was with dedicated human beings all trying to achieve the same goal in making the best picture they possibly could. And since the film seems to be holding the test of time they achieved that goal. Did you get along with all the cast and crew? Who were your favourites? Yes I got along with every body. Strangely enough because of the age difference the person I befriended was the blond haired actor who played little Richie’s friend. He would make me laugh. One time we were on the subway and I started to yawn, at that moment he covered his face and screamed real loud so it looked like I was screaming. The guy was a riot. What was the most difficult part of shooting the movie? I must say there weren’t any difficulties, everyone did their work and enjoyed it. I just had to say my lines and go home. I was having too much fun! Where you a fan of Bruce Lee before making The Last Dragon? Are you kidding, I was a Bruce Lee fanatic! And it wasn’t until just recently that I got over it. He was the biggest inspiration in my life. I have not seen anyone who is as full of life, as dedicated and as charismatic as that man. Truly unbelievable. There has been lots of rumours over the years about a sequel or remake of The Last Dragon, what are your thoughts on this, and have you been asked to be involved? I have heard a few rumours but that’s about it. And no I haven’t been asked. I guess they’re playing it safe. Since working on the movie, did you stay in touch with any of the cast or crew? I met with Taimak and Ernie Ray in Detroit a little while ago and that was fun but other than that I have not been in contact with anyone who worked on the picture. TEXT: © Lee Holmes/The Clones of Bruce Lee 2014 .